No matter who decides to adopt it, the Red Fort needs to be restored — to the people. Subsequent acts over the past decades in the name of conservation have reduced the historic value of the fort. What does the recent controversy over the proposal for a private organisation to partner in the conservation of the Red Fort mean? Is it justified? Would there have been as much noise about any other monument? After all, there have been public-private partnerships in other sites of which the Archaeological Survey of India (ASI) is the official custodian. To come to any reasonable conclusion about these questions, it is necessary to understand the story of the Red Fort, and why this story is both different from, and also similar to, other monuments. The first thing to realise is that the Red Fort encompasses within itself not one, but many stories. Some of these have gained centrestage, such as the one which links the Red Fort with our independence movement. The first prime minister of free India started the tradition of Independence Day speeches from the ramparts of the fort. 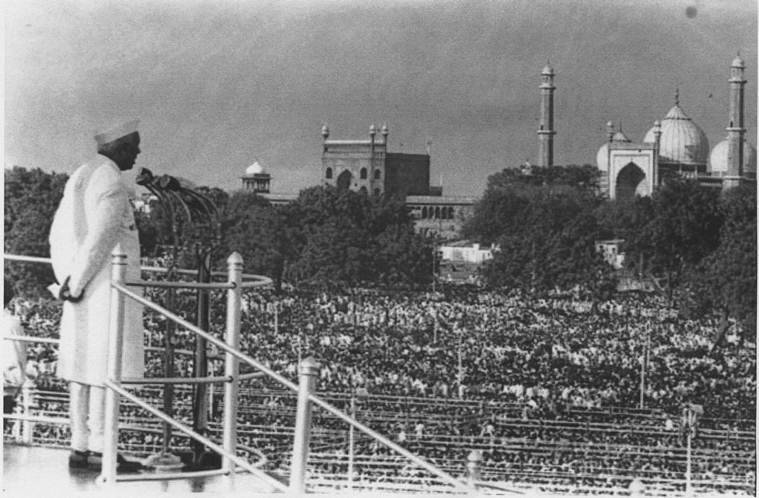 His decision to come here after the formal declaration of Independence at Parliament Hall on August 15, 1947, overturned the schedule of the official Independence Parade to be held on Kingsway (Rajpath) on the lines of the Victory Parade that had been held after the Second World War. Pandit Jawaharlal Nehru was probably influenced by the multitude of associations of the fort — the “Dilli Chalo” slogan of Subhash Chandra Bose, the Indian National Army, the siege and defence of Delhi in 1857, and his own involvement in the trial of nationalists here by the British after World War II. This story is extremely important, but we cannot stop at it. Neither can we tell it appropriately, unless we realise why, in the first place, the fort is such a potent symbol of our identity as an independent nation. Indeed, the wall in front of the Lahori Gate, routinely printed on the front pages of our newspapers every August 15, blocks our view of the fort’s interiors, and is the very opposite of its original appearance. It is literally “a veil upon the face of the fort”, as the ailing Shah Jahan, imprisoned at the Agra Fort, wrote in a letter to his son, Aurangzeb, on whose orders this wall was constructed. Metaphorically, too, when we narrow our vision to just this image of the fort or to one event in its history, we fail to see its pivotal story — the value of its original form and use. All we know about this part of the story is that the Red Fort was established during the time of the fifth Mughal emperor, Shah Jahan. We are not told that it was built with the active involvement of an array of craftspeople, whose tremendous technical skill was integral to its conception and creation. That they did not just implement instructions but were also collaborators in a project that brought together people from all over the Mughal Empire. That they worked in a decentralised way — an extension of the Indian way of life. Court histories record that in the inauguration “artisans of wondrous talent and magical skill” were publicly honoured by Shah Jahan in the Diwan-i-Aam. 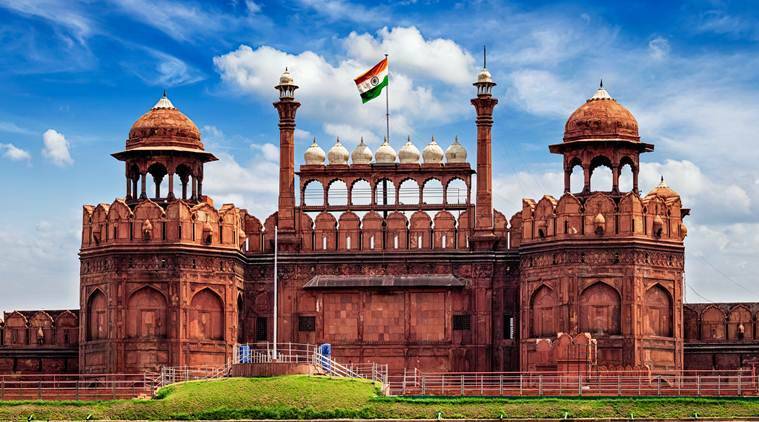 The Red Fort’s design and construction represents not just the sense and sensibilities of its patron, but also those of all the people who worked on it. All of them, in a sense, were its custodians. Since we do not know all this, it is scarcely surprising that we fail to appreciate how beautiful its proportions were, comparable to those we still see at the Taj Mahal. Or how perfectly the fort was planned, so that its construction along with its contemporary city of Shahjahanabad was accomplished in just 10 years. Or how their fame rivalled that of Isfahan, established in Persia by the Safavid emperor, Shah Abbas. Or that 200 years after being visited by artists, ambassadors, imitators and invaders from all over the world, the pioneering British historian, James Fergusson, came upon the remnants of the fort and termed it “The Most Magnificent Palace in the East—perhaps in the World” in his monumental History of Eastern and Indian Architecture (1910). But the Red Fort was much more than just a palace. This multifaceted complex was the urban focus of Shahjahanabad, the first and last resort for the residents of the entire empire, its administrative and political core, a centre of the highest levels of art and music. It was a miniature city — with imperial pavilions, gardens, audience halls, karkhanas, markets, attendants’ houses, stables, quarters for the Mughal army. Fergusson himself compared it to the Escorial near Madrid, one of the few renaissance royal palaces built on the scale of a small city, which was still a fraction of the Red Fort. To put this in today’s context, the fort optimised space in an incredibly efficient way to combine within it the range of activities now carried out in the Rashtrapati Bhavan, North and South Blocks, Lok Sabha, Rajya Sabha, cantonment, Mandi House, Crafts Museum, etc. It cannot, thus, be seen as just any fort or merely branded as “Mughal”. It exemplifies the Indian way of life and design, which it further evolved to even greater refinement, inspiring art and architecture within and beyond the subcontinent. It is difficult to read these stories of the Red Fort today. There are literally big chunks of the fort missing — the result of a radical transformation 160 years ago, during and after the Revolt of 1857. As the seat of Emperor Bahadur Shah Zafar, it was the focus of 1857. In the battles between the Indians and the British, many sections of the fort were damaged. After the British victory, there was wholesale plunder of its precious stone inlay, carved marble panels, gilded copper domes, artefacts and art. In 1860, orders were passed to demolish everything within the distance of 500 yards around the fort, and more than 85 per cent of its internal buildings, courtyards and gardens. Barracks for the British army were constructed on the cleared areas after “this fearful piece of Vandalism”, as Fergusson put it. Instead of accommodating different kinds of people within the fort, only one use was made of it — that of a British garrison, insulated from and barred to Indians. So, what we see today are the very few Mughal structures that escaped this demolition. They have lived through years of desecration; used by the British as prisons, canteens, hospitals, mess rooms, ammunition depots. 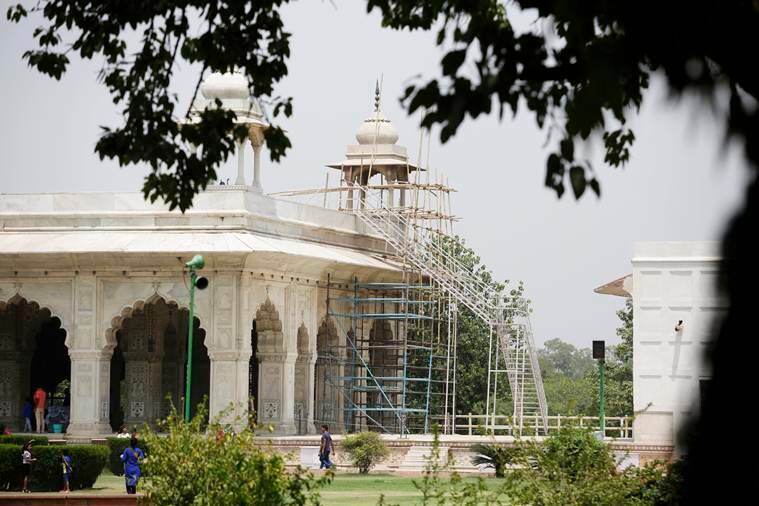 From the early 20th century, they also went through cycles of restoration that began with their presentation as showpieces to British royalty such as King George V, who visited Delhi in 1911 for the Coronation Durbar. Why is it that most of us who visit the fort do not know this? It is because we are not given any clues about this part of the story. To unearth these clues on our own is difficult. We would need to piece together available fragments from many different sources — official court chronicles, miniatures, archival paintings, travelogues, photographs, drawings, etc., and, most importantly, the few Mughal buildings that still exist in the fort. That is what I began to do 20 years ago. It was only then that I could visualise the fort’s original form and function. I realised how imperative it is that each part of what exists of this unique design — mere shadows as they are of their former selves — still has immeasurable value and has to be looked after with the greatest thought and care. And how imperative it is to give sufficient information at site, to involve visitors in all the facets of all the fort’s stories. For this, it is necessary to have a clear understanding of its historical layers, as well as its defining attributes, so that we do not destroy them in however well-meaning a way. This, in essence, is what I had also communicated to the ASI in my role as their conservation consultant in 2000. Their reluctance to even read my recommendations led to my decision to resign from this role. 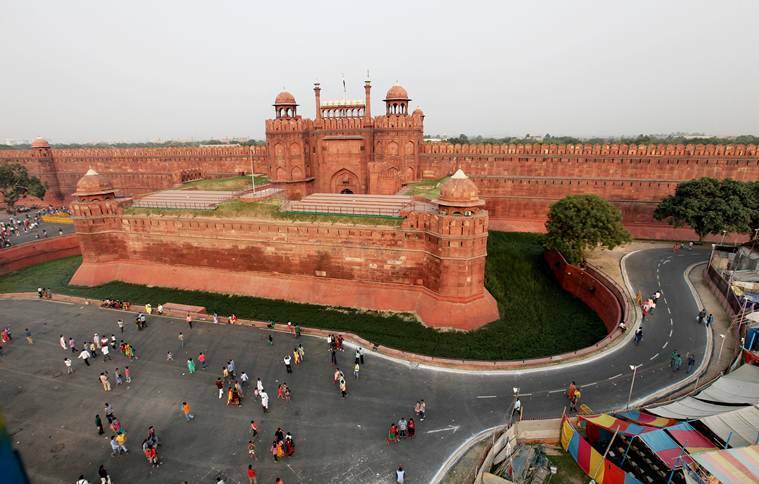 Express Opinion | Will Red Fort Become Dalmia Red Fort? Subsequent acts over the past decades in the name of conservation have reduced the historic value of the fort. The Indian army, which occupied part of the fort after independence, has been asked to move out, ostensibly to ensure better conservation. There may have been some efforts towards this, but from what is visible, it appears that the fort’s maintenance has gone from bad to worse. Rare remnants of its original proportions have been effaced. Conjectural and ill-advised interventions above and below ground have been inserted. Finely worked remains of craftsmanship in the imperial pavilions have been replaced by crude restoration. Entrance to these fragile and rare buildings has been blocked by barriers of untidy ropes, rusted pipes propped up against stairs, taciturn and impatient guards. The ASI, following the colonial model of keeping the natives out, remains tightlipped about its plans to conserve the fort. This is ironical, given the fort’s symbolic value as a national icon of independence. The insistence on viewing the fort as a monument with no real interaction with people is no different from its use by the British as their garrison. People are not just kept out literally from parts of the fort, but also from its decision-making process. This is why we can only react retrospectively every time a disaster strikes it. One such time in the fort’s recent history was when a public interest litigation was filed in 2003 to protect it against further degradation. It was only after part of the renovation work by the ASI was already done, that it came to the notice of art curator Rajeev Sethi and others. He and other petitioners were able to demonstrate the inappropriateness of this work, through a historical record of the fort prior to this intervention. Though they were successful in obtaining a decision to review and direct to some extent the fort’s future conservation, there has been no real change in how it is viewed or interpreted. I would argue that it is not enough to form more committees and authorities or promulgate ever-more rules and policies. Seventy years after independence is enough time to stop regarding our monuments as fiefdoms of either official or private bodies. We need a fundamental change in attitude to evaluate what should be the objectives of the custodianship of our heritage. Should we still be seeking ratification for our past from elsewhere in the world? Should we be trying to get “World Heritage” tags, or concentrating our efforts to make our heritage relevant to our own people? Is it enough to involve only professionals within these domains, whose “disabling effect”, as the Austrian philosopher Ivan Illich terms it, works on a principle of exclusion and monopoly? Should we not let citizens have a say in the planning of our cities, whether related to monuments, roads, or infrastructure? What would such a process have meant for the fort? It means we could have guided through appropriate conservation norms, the continued presence of the Indian army to keep alive one of the historical uses of the fort, and to contribute to its better security. It means we could have reinstated the ecologically appropriate orchards that originally surrounded it, instead of making swathes of water-guzzling lawns ringed by high metal fences. It means we could have integrated the economic and social well-being of the people living and working around the fort, by including them as skilled guides and representatives of our cultural heritage. It means we could have made it a truly national symbol, with the possibility of engaging resources from any member of our nation, who wished to contribute their money, expertise or ideas. It means we need not have given anybody the freedom to jeopardise its physical and historic presence, whether official custodians or powerful business interests. It means we need to remind ourselves about the pertinence of the question: whose fort is it, anyway? This is true not just for the fort. Other, less complex sites, which have seen less transformation, will also have many stories, individual and unique to them, even if perhaps not as many as the Red Fort. They will also need to be interpreted and integrated with people around them. I would suggest that the relevant wing of the government, whether it is the Ministry of Tourism or the ASI, share the vision plans that they have accepted from different organisations — not just for the Red Fort, but for all the heritage sites that are planned in the Adopt-a-Heritage Plan. Let these be in the public domain, easily accessed by citizens; let their comments and feedback be sought and considered. Let us take this opportunity to own our right and our responsibility for the custody of our heritage. So far, we have interpreted “custody” — whose dictionary meanings are both “protective care” and “imprisonment” — within meanings that see people as interlopers. We need to now see custodianship as protective care, both for the monuments we profess to conserve, and the people whom we ostensibly conserve them for. The writer, an architect with a specialisation in conservation, is the author of The Red Fort of Shahjahanabad.